The head of the United Nations agency tasked with defending freedom of expression today expressed grave concern over the constant killing of journalists in Syria, following the death of television reporter Suhail Mahmoud Al-Ali on Friday. “I condemn the killing of Suhail Mahmoud Al-Ali,” said the Director-General of the UN Educational, Scientific and Cultural Organization (UNESCO), Irina Bokova, recalling that more journalists were killed in Syria in 2012 than anywhere else. According to the non-governmental organization Reporters Without Borders, Mr. Al-Ali died from injuries while covering fighting in the city of Aleppo. In total, 41 professional and citizen journalists died in Syria last year and more than 60,000 people, mostly civilians, have been killed in the country since the uprising against President Bashar al-Assad began in early 2011. Recent months have witnessed an escalation in the conflict, which is now in its 23rd month. Separately today, a UN spokesperson announced that the Joint Special Representative of the United Nations and the League of Arab States for Syria, Lakhdar Brahimi, will meet on Friday in Geneva with Russia’s Deputy Foreign Minister, Mikhail Bogdanov, and the United States Deputy Secretary of State, William Burns. The meeting is aimed at furthering their discussions to arrive at a political solution to the crisis in Syria. Mr. Brahimi has been holding meetings in the Middle East region and elsewhere, as part of his efforts to bring an end the conflict. 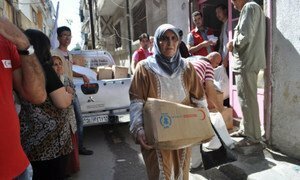 The United Nations food relief agency today warned that humanitarian needs in Syria – especially for food – are growing, with serious bread and fuel shortages across the war-torn country.